Mens Vineyard Vines Button Down Size M Whale Shirt Oxford Collar soft yellow. Condition is Pre-owned. Shipped with USPS First Class Package. Oxford gets schooled! · Machine wash cold, tumble dry low. · One-button barrel cuffs and one-button sleeve plackets to roll 'em up or keep 'em down in style. · Fabric that's light, strong, and absorbent. Color - Coastline Blue (see photos). Style - Button down long sleeve collar shirt with logo buttons and signature whale logo on front. Size - Large. Fabric - 100% Cotton. Vineyard Vines Tucker Oxford Shirt M Purple Gingham Cotton EUC YGI B9-750 Excellent condition, no flaws Photos tell the story best ... See detailed measurements of the item in photos using a tape measure — check them carefully as sizes vary! Check out our amazing inventory of other items by including the three letters YGI in your search. For example, type in your search ““ickey Freeman YGI ““to see all of our Hickey Freeman items. STOP! Before leaving anything other than positive feedback, please contact us to work out an amicable solution. At YGI, we honor our return policy 100 percent. So, if you are unsatisfied for any reason, simply return the item for a full refund. Our feedback speaks for itself and we want to earn your repeat business. 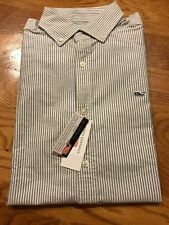 Vineyard Vines Classic Fit Tucker Shirt. 100% Cotton. armpit to armpit- 27 in. shoulder to bottom hem- 30.5 in. WHALE LOGO ON THE CHEST. STYLE: ~ SLIM FIT TUCKER SHIRT ~. BRIGHT WHITE OXFORD COTTON. BUTTON COLLAR. MATERIAL: 100% COTTON. CHEST POCKET. Condition is Pre-owned. B lu e li ne s. P in k check. Color: Flamingo Pink. Spread collar with button front closure. Sleeve Length 26 in. Long sleeves; one. Classic Fit. 100% Authentic. 100% Cotton. · Button-down collar. · Signature logo buttons. · Sleeve placket with button. · One-button cuff. · Embroidered whale on pocket hem. The dark spots on the pics is just a shadow, this shirt is new condition. Material: cotton. Color: light green. Bottom of the collar to the hem ~ 31.5". Shoulder to end of sleeve ~ 24.5". Pit to Pit ~ 25". Allover embroidered marlin fish. A long sleeve Murray Shirt. 7-Button Front with a button-down collar. Machine washable. Notes: Light weight corduroy. Communication is BEST! Sleeve Length (Shoulder Seam to end of Cuff): 23.5". Length (Top of Shoulder to Bottom Hem): 31". Purchasing Policies. Pit to Pit: 23.5". Length (collar-to-hem) - 31”. Excellent, like new condition. No holes, tears, or stains. 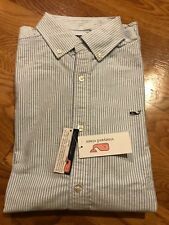 Vineyard Vines Slim Fit Party Oxford Whale Shirt. ANY IMPERFECTIONS WE WILL NOTE IN OUR PICTURES. We only deal with 100% authentic products with no exceptions! Classic, comfortable and cool, the Vineyard Vines Whale Shirt is perfect all year round! Button down collar. One button cuffs and sleeve placket with button. Color Specific Maui Blue. Color Blue. Product Details. ANY IMPERFECTIONS WE WILL NOTE IN OUR PICTURES.